Denied credit by a firm? 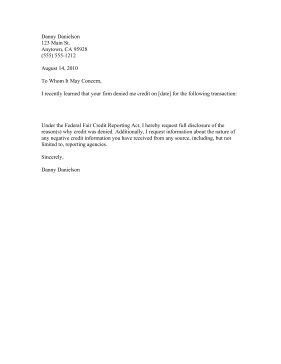 The Federal Fair Credit Reporting Act requires disclosure of the reasons, and this letter lays it all out. Under the Federal Fair Credit Reporting Act, I hereby request full disclosure of the reason(s) why credit was denied. Additionally, I request information about the nature of any negative credit information you have received from any source, including, but not limited to, reporting agencies.